Training Fun in the Kingdom! | don't bite the apple…work is not a fairy tale! Training Fun in the Kingdom! I was at a client and this was in their break room. I just loved it. I guess because sometimes it’s so true! 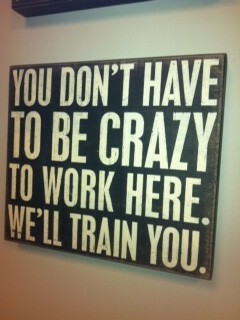 Welcome to crazy, here’s your cubicle! Luckily, it’s not true there. But we’ve all had one of THOSE jobs. This entry was posted in Cackles and tagged employees, Employment, human resources, training. Bookmark the permalink.